As I child, I understood the poetic magic of origami even before I knew the name of the art. One of my great-great aunt's many skills was paper-folding. She could swiftly make an origami bow tie appear out of a paper scrap. That fascinating talent was as magical ability as anything I'd ever witnessed, and it was always an honor to receive one of her tidy, crisp bow ties. Since it's National Poetry Month, the kids and I picked up a few new poetry books at the library. 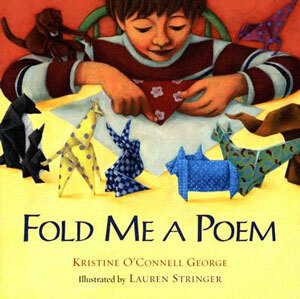 One picture book we particularly like has an origami theme -- Fold Me a Poem by Kristine O'Connell George, illustrated by Lauren Stringer. The summary on the copyright page states that the book is "a collection of poems about origami animals." In reality, the Fold Me a Poem is much more than a collection. The poems, read together in succession, collectively tell a story about an imaginative boy who plays with his origami creations all day long, from the moment he wakes up in the morning until he falls asleep in his bed at night. The short poems are rather like private thoughts as he brings the origami animals to life, folding them into splendid creatures and playing with them afterward: "Forty bright sheets / of colored paper, / a world of animals. / Who will be next?" The animals race each other, hide, and get into trouble. Even the boy's cat joins in the fun, by attacking and injuring a poor pink ostrich during a "wind storm" produced by a fan. The cleverly designed square book has end papers that look like origami paper. In total, the book contains 32 original poems. It does not include instructions for creating origami animals -- however, the illustrator in her end note mentions various book resources. This poetry book provides wonderful inspiration for showing children how to capture their own thoughts in poetry form on paper! All children need to do to write their own poems is describe their own play. O'Connell's poems are written in many different forms including haiku, apostrophe (poems of address), mask or persona poems, and process poems, making the book a useful springboard for teaching these styles. Lauren Stringer's painted illustrations beautifully accompany the poems and are instrumental in helping the reader visualize the poems. Stringer skillfully captures the origami creatures -- folding origami is hard enough, but painting all the shadows, showing the folds through illustration takes real talent indeed! As for favorite poems, I adore "Night," a poem that tells how the boy adds his own star to the night sky. My son likes the poem "Tub" mostly because the illustrations for the poem show many of the origami creations (including a bandaged ostrich) waiting for a ride on an origami boat. My daughter especially likes "Mystery" because it fully captures the wonder and joy of creating your own origami. Anything, yes, anything is possible with a little imagination. The directions to fold the chick and egg origami can be found at http://www.kutchuk.com. The design is made from a single piece of paper. 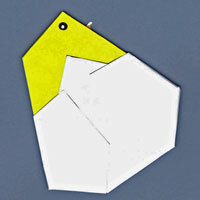 This is an easy, beginner origami project for kids. I created a pdf template with folding guides to make it even easier to fold your own origami if you'd prefer to use that instead. One is full color and the other can be colored-in by a child. Make sure to print with page scaling set to "none" or unclick "fit to page" so that it doesn't resize the document. Click on the google doc links below to print your own copy (clicking on the image won't work). To extend the poetry in a pocket idea and fold a poem, you could have your child write the poem on the paper before folding it into the chick/egg shape! Or, if your child can't write, print out the poem and tuck it into the pocket formed by the folded egg shell. I haven't heard of this book, but it sounds wonderful. Even though poem in your pocket day is past, I'm going to print out the baby chick origami, my four year old will love it. I have heard about this book before and read the reviews.. I love the idea behind the poem and origami. Thanks for the reminder.. am off to find the book at the library! I was just looking for more origami linked books - glad to see this one!